Our family is tofu lovers, so our tofu recipes have been growing nicely over the years. 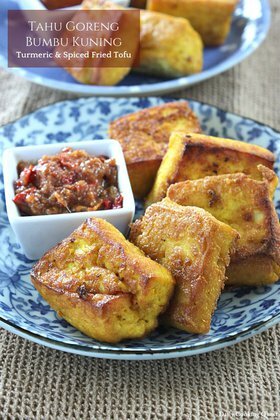 If you need a new tofu recipe, do give this tahu goreng sambal sereh - fried tofu with spicy lemongrass relish a try. If you can buy freshly fried tofu cubes in side street or supermarket, the only thing you need to do is to prepare the spicy relish. If you need to prepare fried tofu cubes on your own, the most important thing to remember is to properly drain as much liquid as possible from the tofu. Since this is a super important step, you can even buy tofu presser to do this step for you. But, I usually just wrap firm tofu with paper towel, sandwich between two plates and place my heavy cast iron skillet on top. I recommend letting the tofu drain for at least 30 minutes, though I usually leave them for one hour. Once it is drained, simply cut the tofu into cubes, sprinkle with salt and pepper, coat with flour, and pan fry until golden brown. This spicy relish is simple to make as long as you have the ingredients. The spices include lemongrass, shallot, garlic, red Thai bird eye chilies, and for the seasoning, salt and pepper. Heat oil in a frying pan and sauté thinly sliced lemongrass, shallot, chilies, and minced garlic. Once it is fragrant, season with salt and pepper. 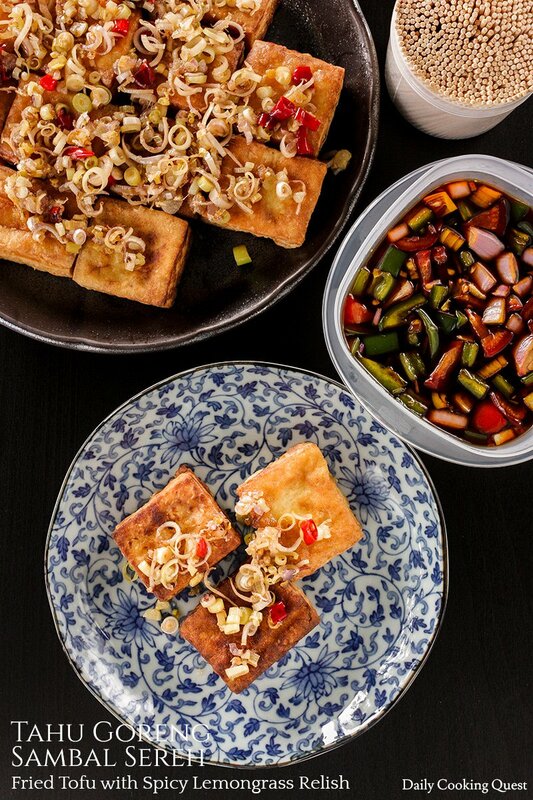 Arrange fried tofu cubes in a plate and top with the spicy lemongrass relish. Season each tofu cubes with salt and pepper, and dust in all purpose flour to coat. Heat oil in a frying pan, and fry tofu cubes until golden brown. 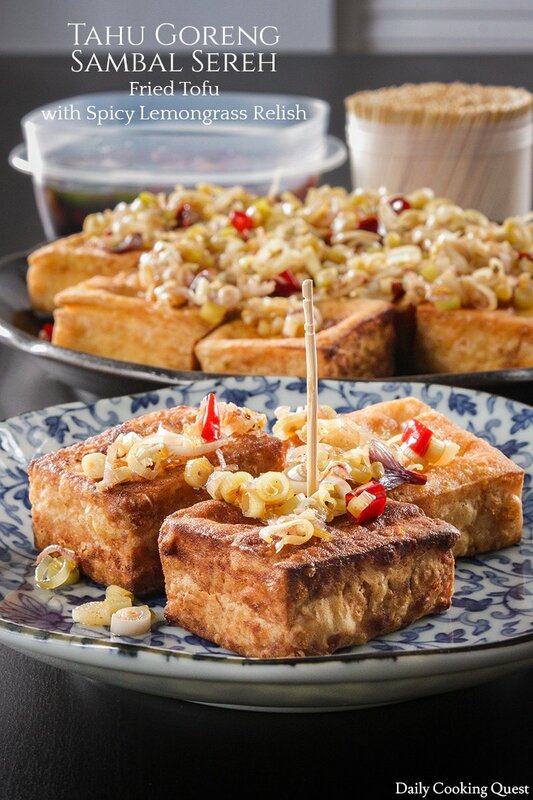 Arrange fried tofu cubes in a serving plate and set aside. To make the spicy lemongrass relish, heat 2 tablespoon oil in a frying pan over medium high heat. Once the oil is hot, sauté lemongrass, shallot, garlic, and chilies until fragrant. Season with salt and pepper. Turn the heat off, and pour the spicy relish over the arranged tofu cubes. Serve immediately. (*)If using the smaller Indonesian shallots, you will need 3. What a great idea, lemongrass relish sounds lovely! The relish is indeed delicious. And if tofu is not your cup of tea, you can always pair the relish with pan fried chicken breasts. I do love tofu. I use to eat a lot of tofu when I lived in Singapore. Now not so much. I love the flavors and color you have on these cubes. Sounds so refreshing. 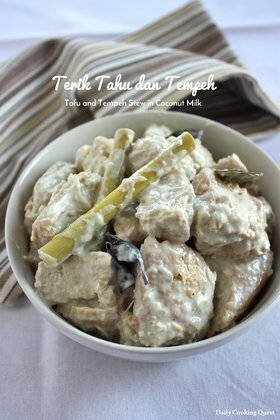 Nice recipe, I also like using tofu. I use it in my chilli paneer recipe, but replace paneer with tofu. Same here Jagruti, though in my case I use mostly tofu, and only sometimes I switch the tofu with paneer. Oh nice I idea. I've been eating quite a bit of tofu recently. I must try this! I am dying to use this lemongrass relish. This little bit of spicy relish sounds perfect for tofu! 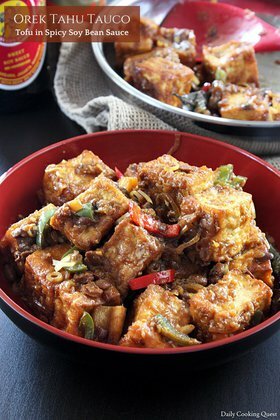 Fried Tofu with Spicy Lemongrass Relish recipe is very awsome. Tofu was increased recipes taste.